What better way to start an exercise program than with an hour long fitness assessment? 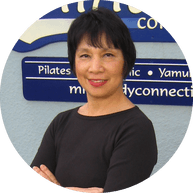 You'll spend an hour with Angi Spector, the founder of MindBody Connection, determining your current range of motion and strength. You'll spend a good portion of the hour discussing your current wellness practices and outlining a plan to reach your fitness goals. ​Each Starter Package has three classes. ** Pick and choose which classes you come to. After you've done three classes, you'll feel your body start to change. Choose any three group classes including Pilates Mat, Yamuna Body Rolling, or NIA. Choose any three Reformer or group classes. Mix and match or take all Reformer classes (it's entirely up to you!). ** Starter packs expire 1 month after purchase. Please be sure to schedule all three classes within that month! Mind Body Connection-Pilates © All Rights Reserved.